Most Trusted Telecom Brand in India Bharat Sanchar Nigam Limited (BSNL) extends two new Volume based Special Tariff Vouchers (STVs) to send SMS under GSM Prepaid Mobile Services. 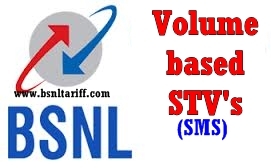 The BSNL Competent Authority of Tamilnadu Telecom Circle has announced to extend of two new Volume based Special Tariff Voucher (STVs) of Rs.19/- and Rs.72/- for limited period for 90 days under promotional basis across Tamilnadu Circle (Including Chennai Telephone District). New Special Tariff Voucher of Rs.19/- offers, Local/National 650 SMS to any Network with validity for 7 days. Activation of this STV to sent through SMS keyword to 53733 as SMS19. New Special Tariff Voucher of Rs.72/- offers, Local/National 2500 SMS to any Network with validity for 30 days. Activation of this STV to sent through SMS keyword to 53733 as SMS72. Availing of SMS activation the STV amount will be deducted form the customers main account balance. Both the above two new STVs are applicable within the Circle and National roaming. Both the above two new STVs are applicable for all plans. The above promotional offer will be implemented and with effect from 10-07-2013 to 07-10-2013 for limited for 90 days.